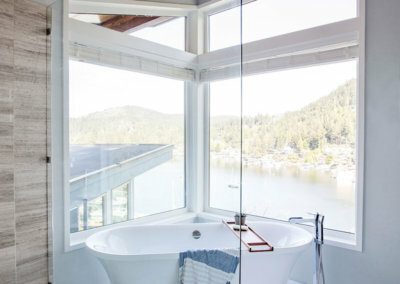 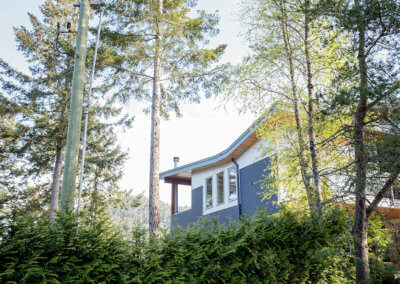 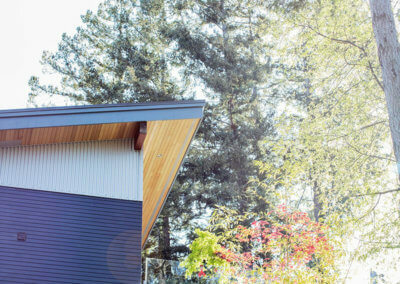 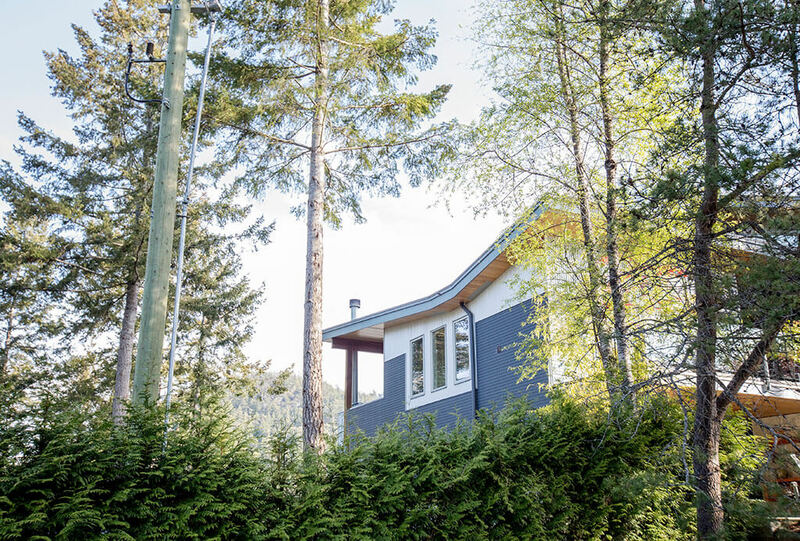 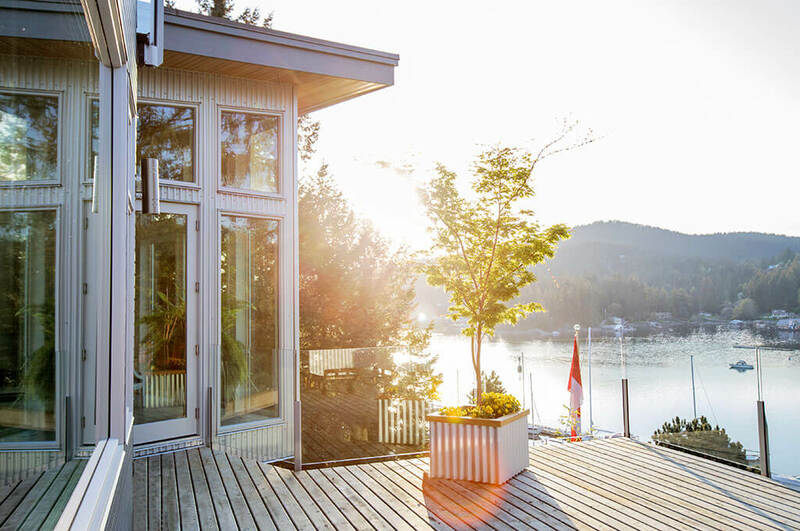 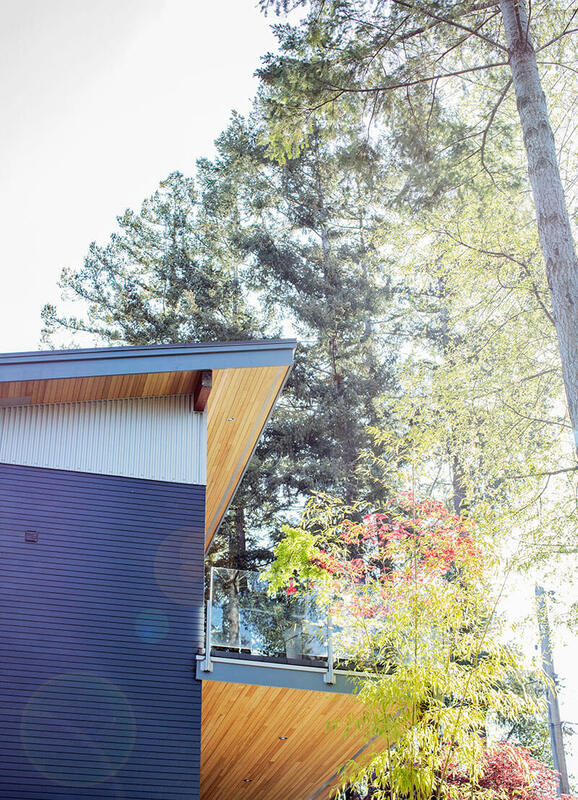 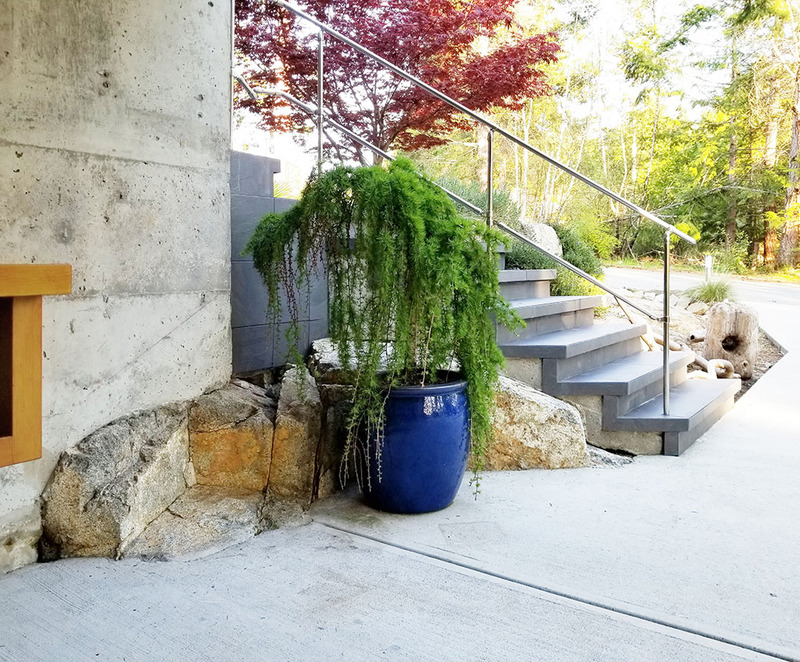 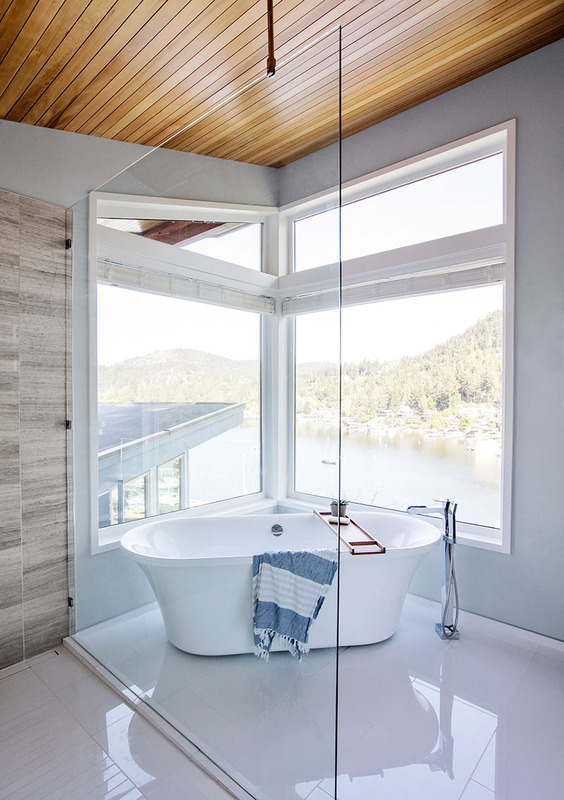 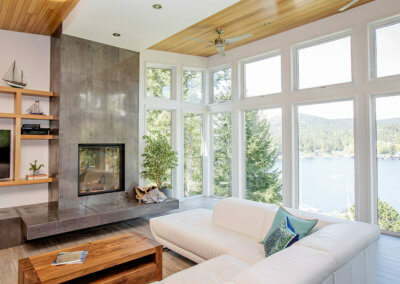 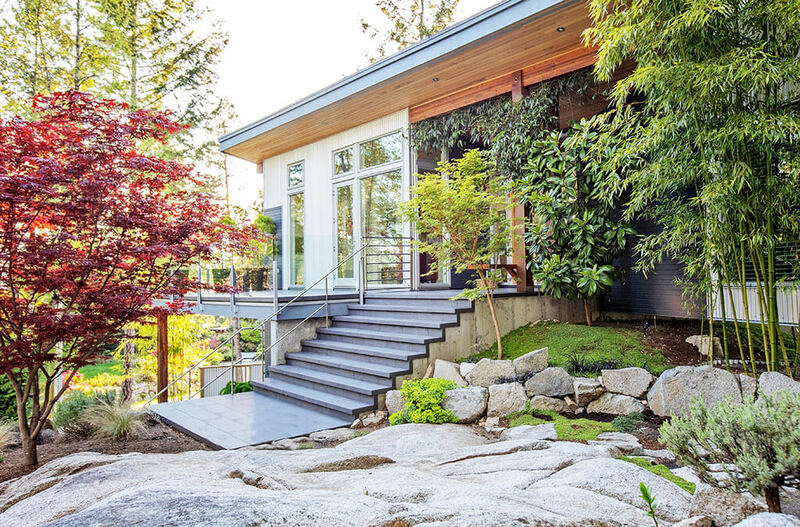 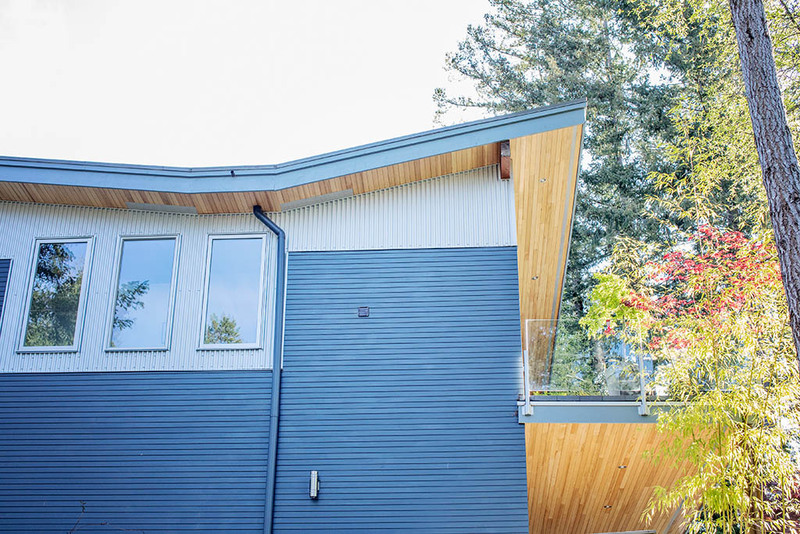 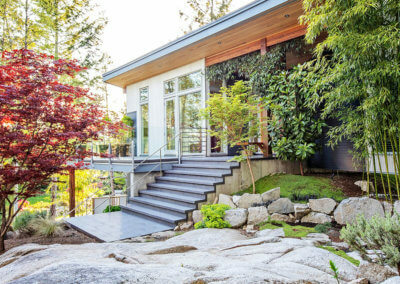 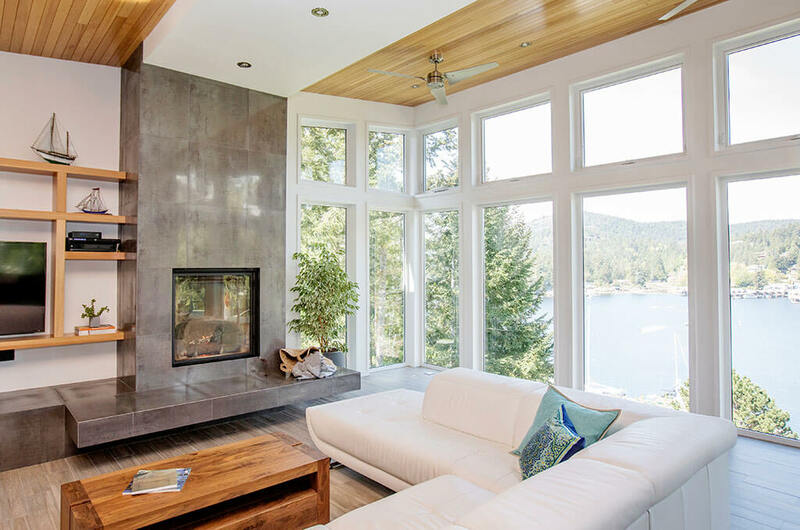 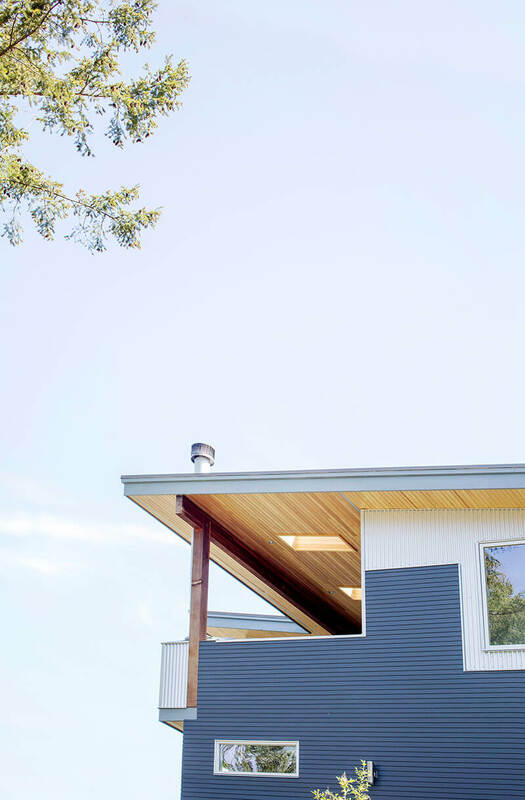 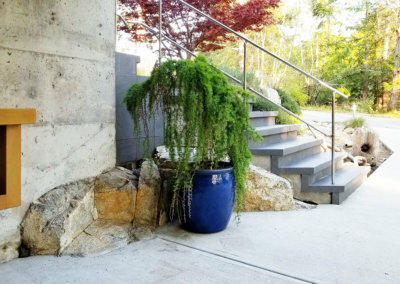 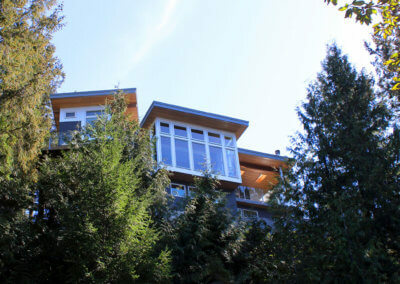 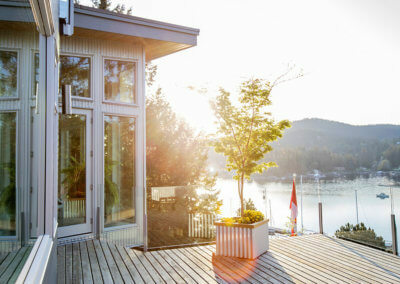 Perched atop a terraced outcrop of granite overlooking Maple Bay on BC’s Sunshine Coast, the Cliff House is a whimsical extension of the natural site and surroundings. Movement and light play throughout the architectural form framing dramatic views in all directions. 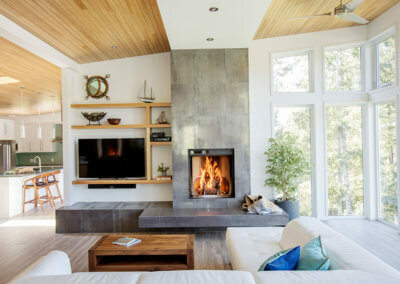 The design process revolved around an extensive site analysis and solar study to understand the unique and rugged beauty of the property and to optimally site the house and each individual room. 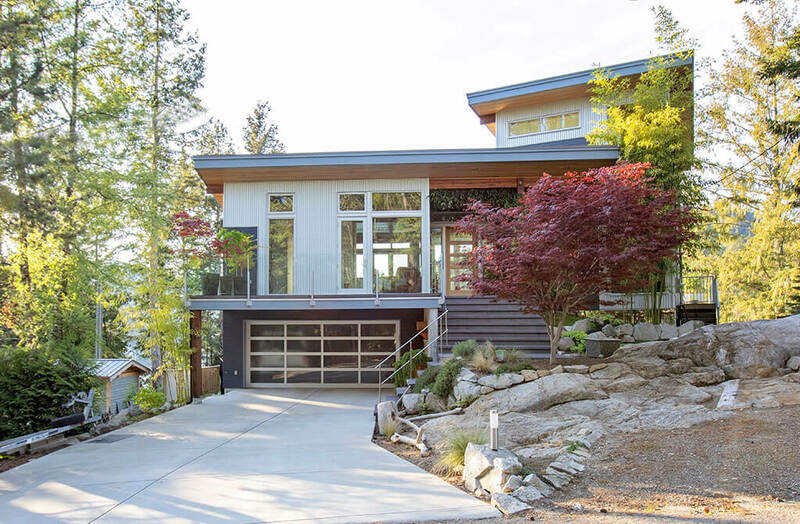 Architecture and site merge at wood and stone-tile clad walls which rise and transition with a strong stepping silhouette, emulating the boxy granite masses and organic ground cover on the site. 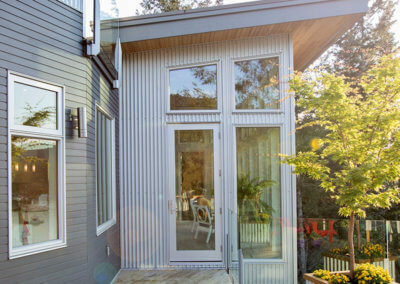 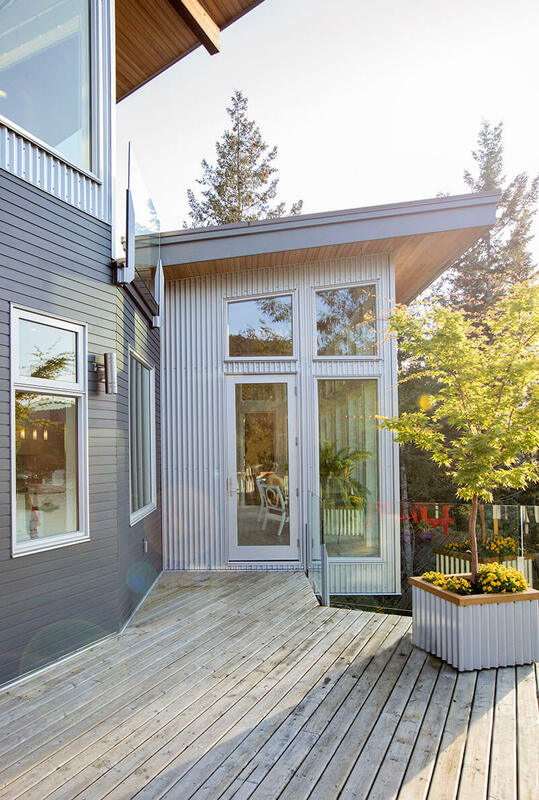 From this solid mass rises a lighter wall clad in vertical metal standing seam siding with a reflective and metallic finish. 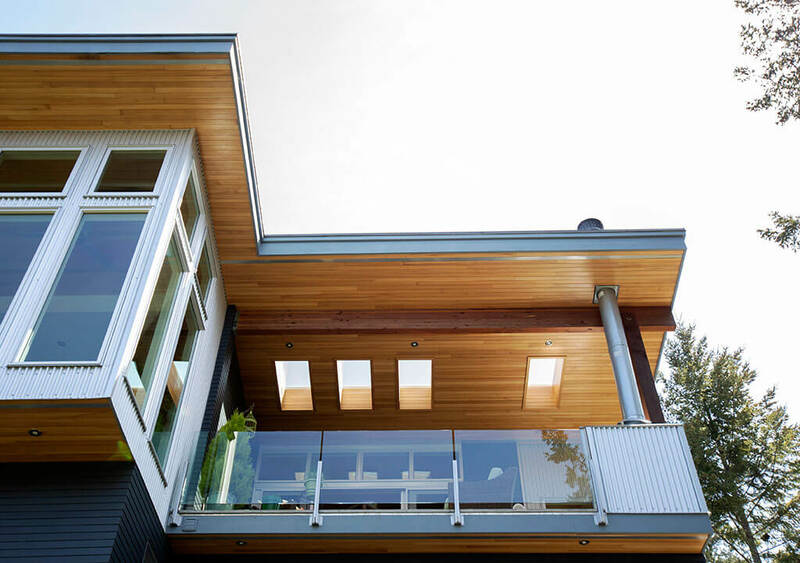 This airy massing is punctuated by glazing, vertical shadow lines, and tall posts. 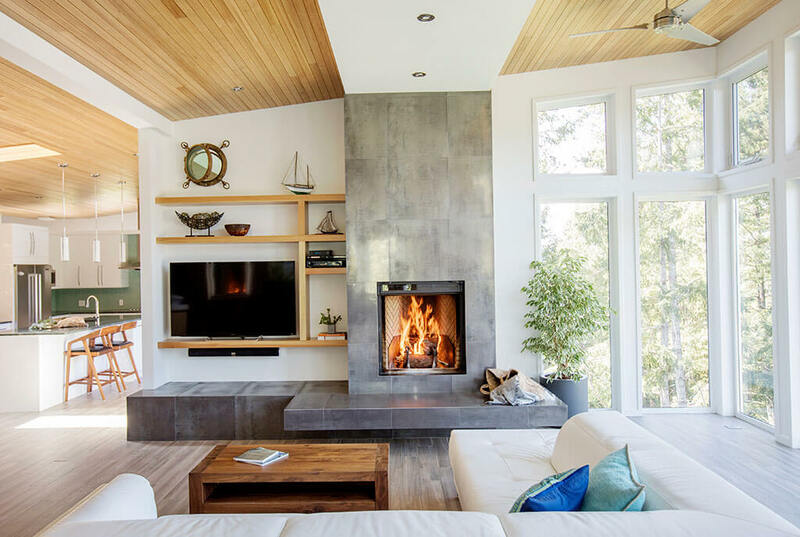 It evokes the space between earth and clouds, occupied by tall West Coast coniferous trees and the views captured between them. 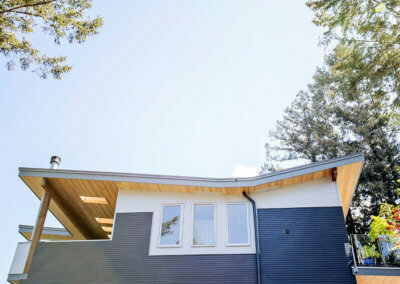 The final layer is the reaching butterfly roof which appears to float above the airy metallic walls below. 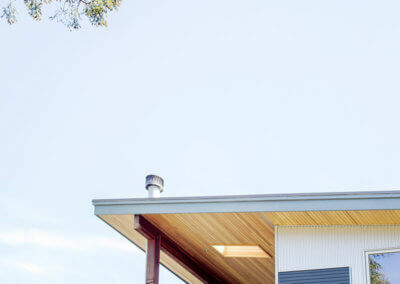 Its form references a high cloud cover, lifting and folding in the wind. 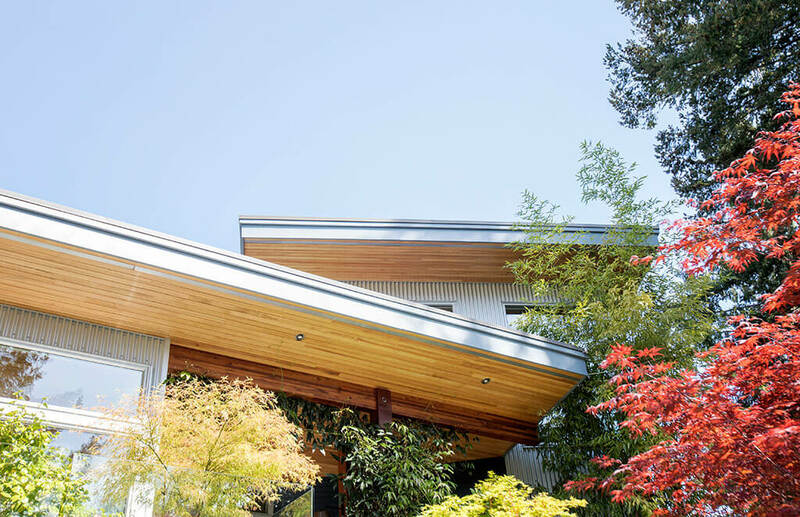 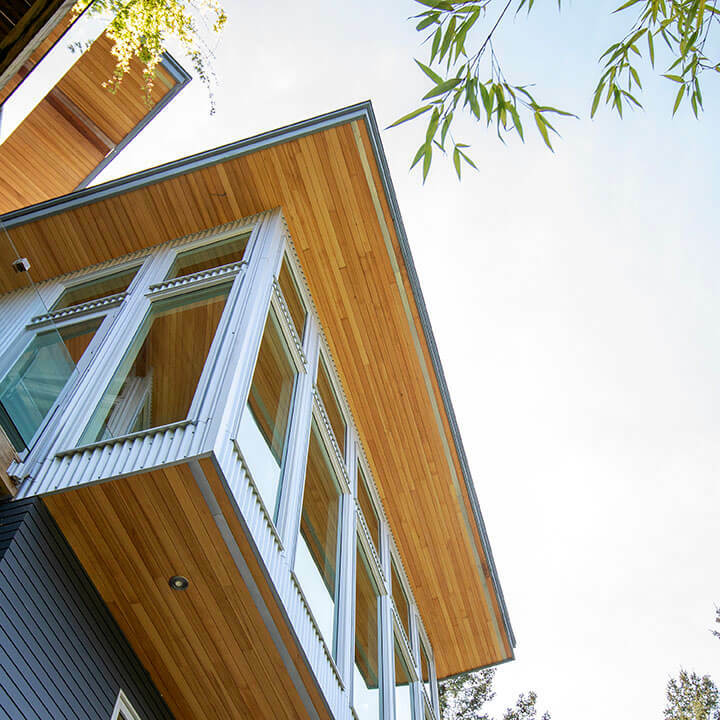 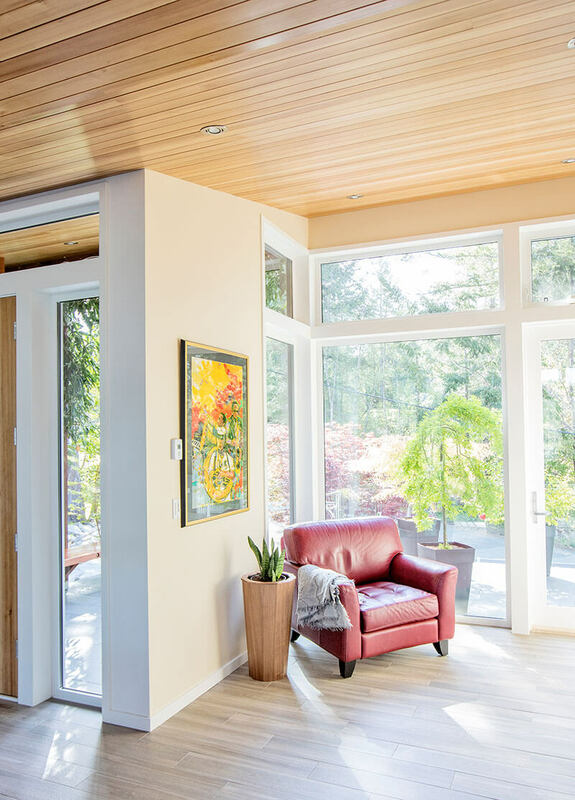 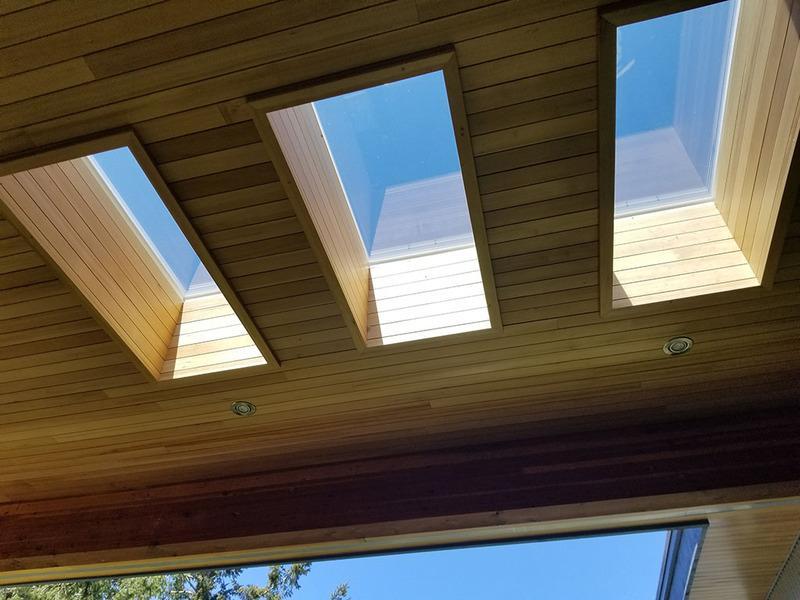 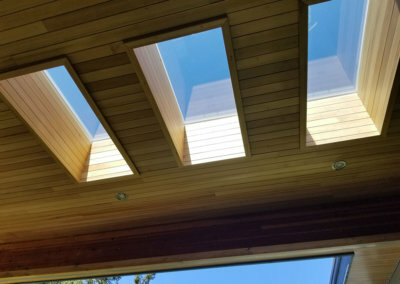 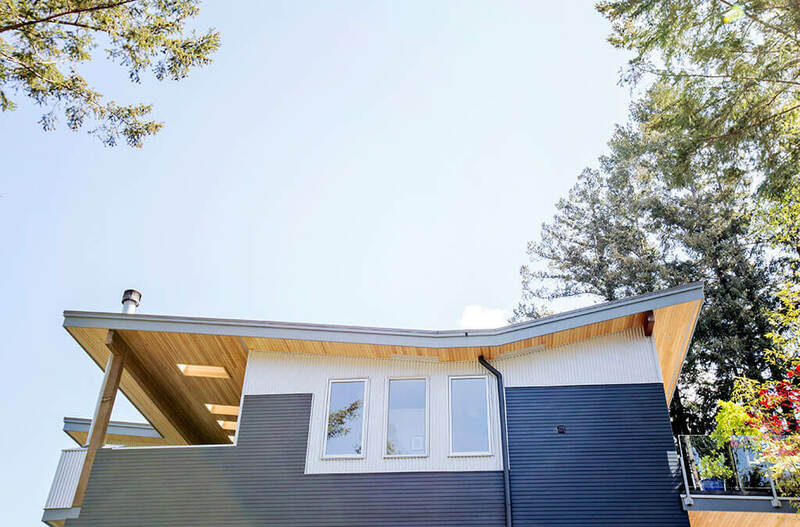 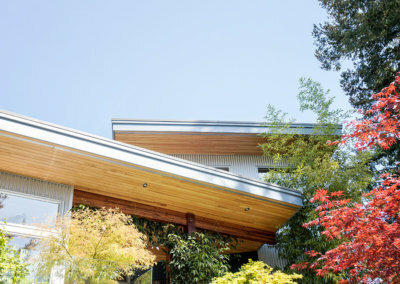 This distinctive roof with its rising overhangs draws you in, and once inside the door, the roof line lifts and opens up to the striking views to the north. 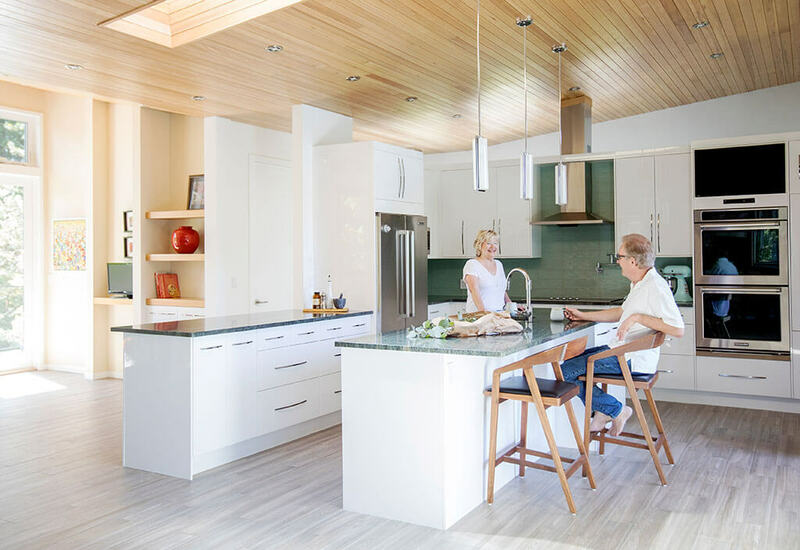 The two rectangular plan blocks are at an angle to each other, creating a dynamic tension in the triangular space between, which is occupied by the social living and dining areas. 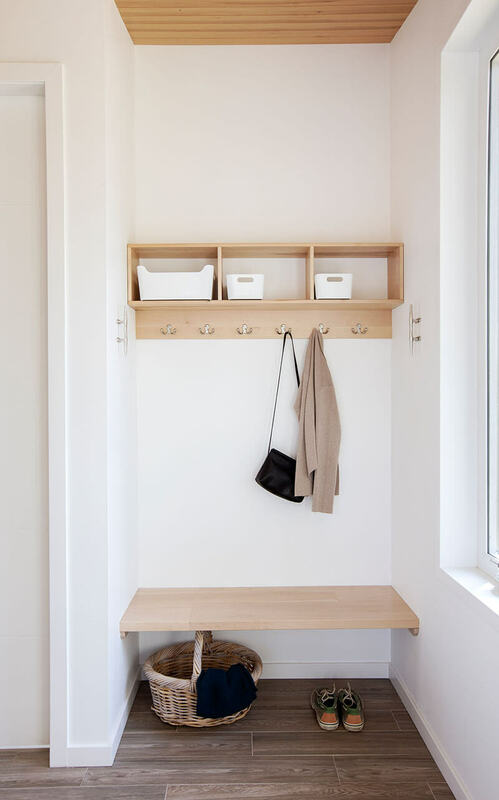 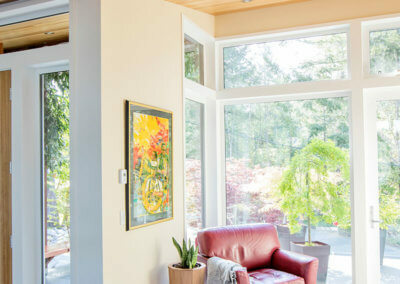 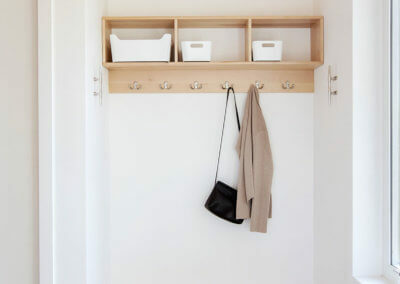 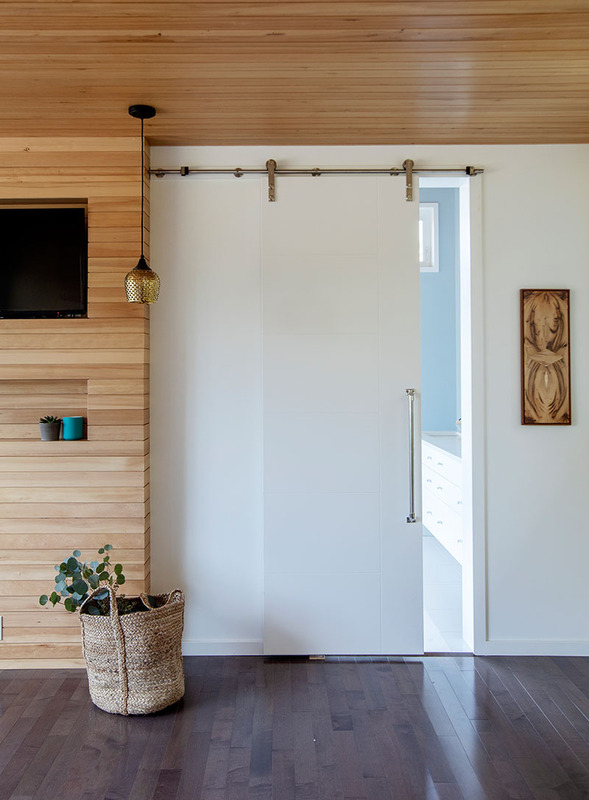 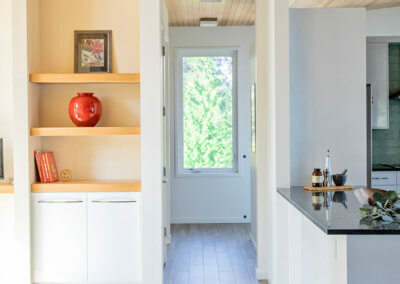 Within this space there is an expanded line of sight to the east and west, contributing to the open flow and visual movement within the house. 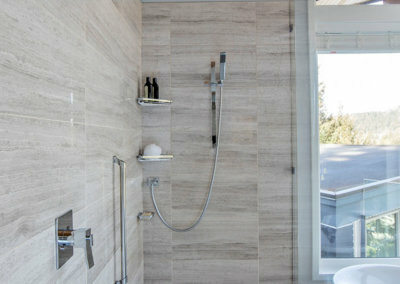 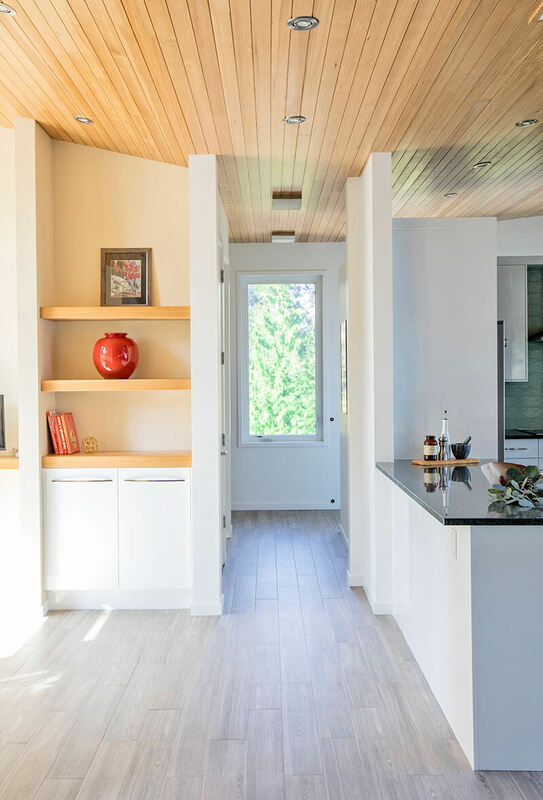 Natural floor, wall, and ceiling finishes flow from the interior to the exterior creating a constant connection with the surroundings. 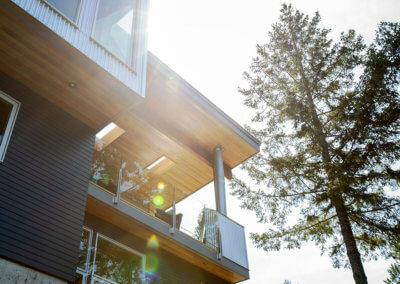 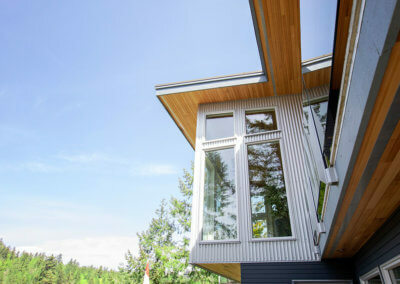 Sustainability was important to both client and architect and thus permeates the design. Integrated passive heating, cooling, ventilation, thermal massing, and daylighting are especially useful in this rural location where the electrical grid is unreliable. 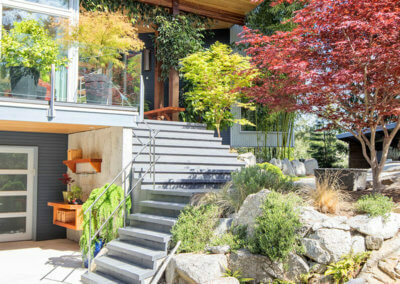 Specified materials favour natural, local, and environmentally benign products with recycled content. 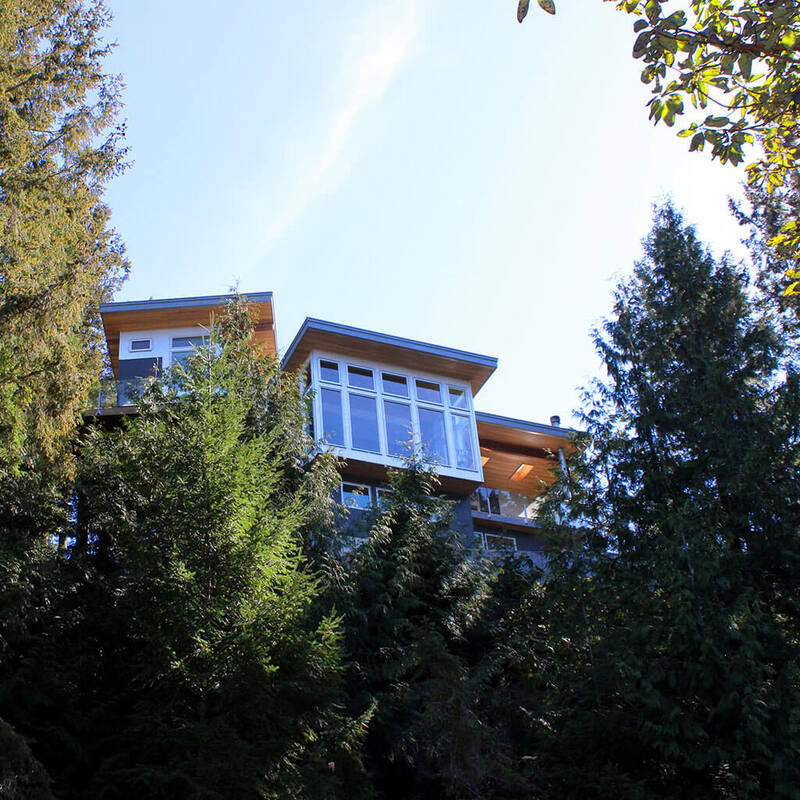 A structure strengthened by steel and the use of durable and high quality materials ensures the longevity of Cliff House. 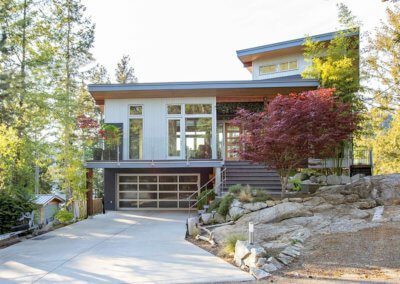 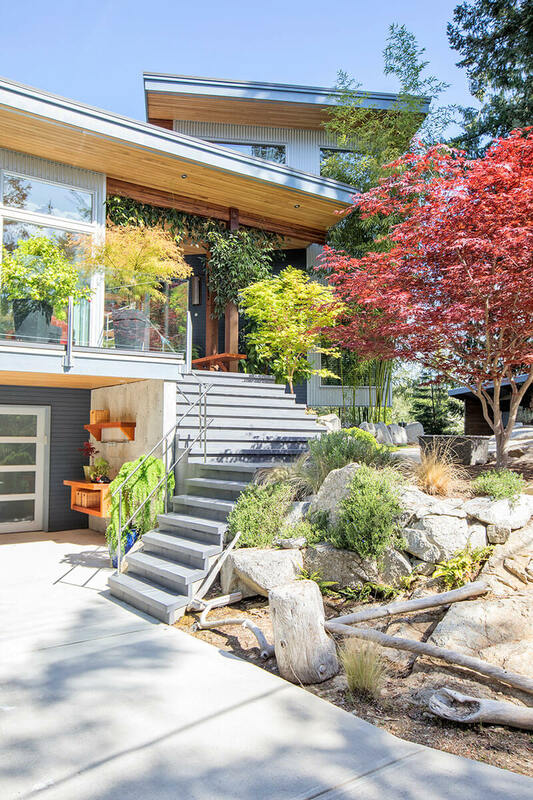 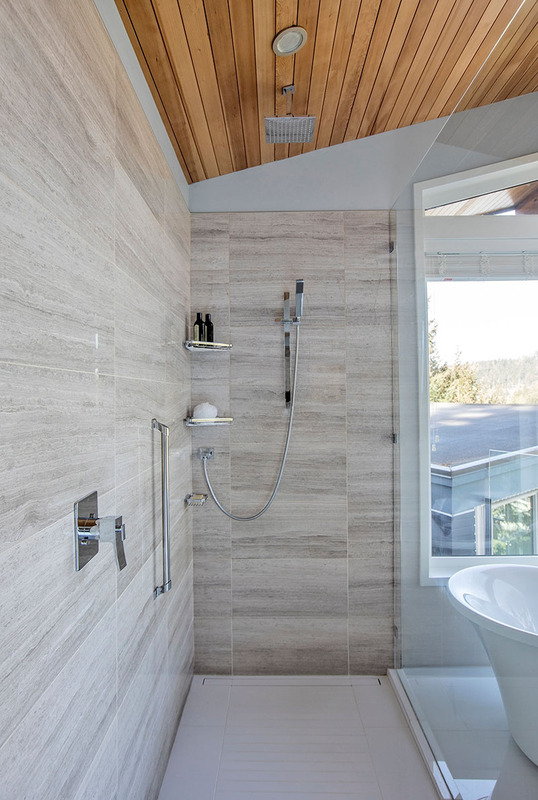 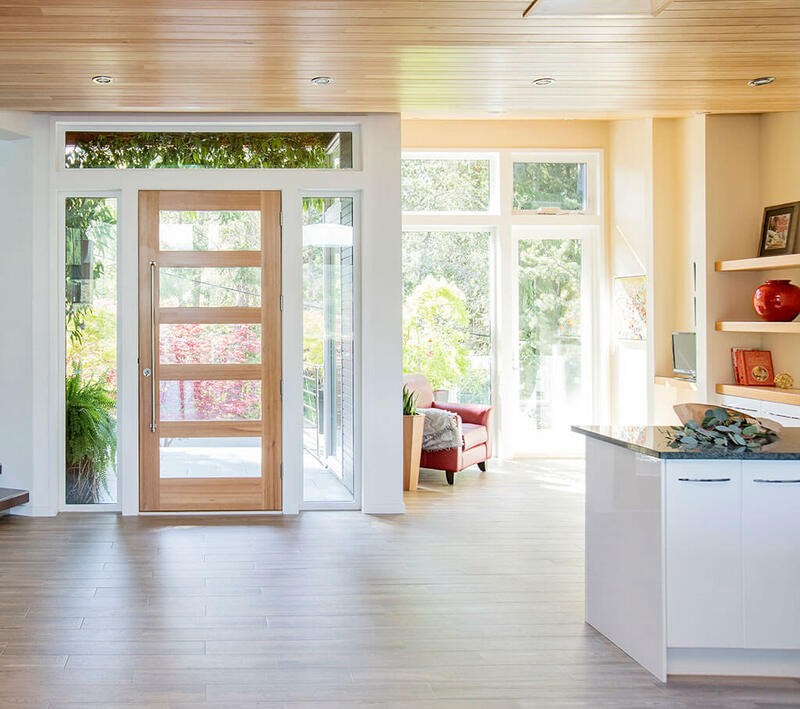 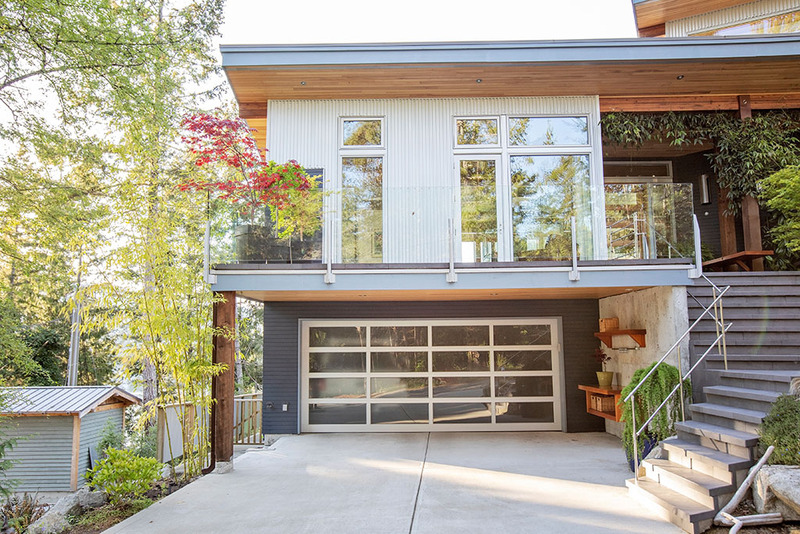 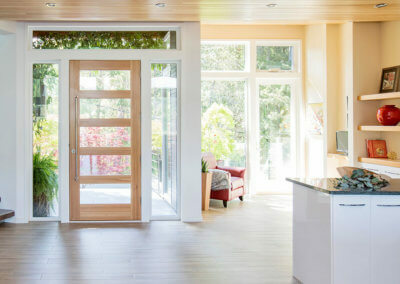 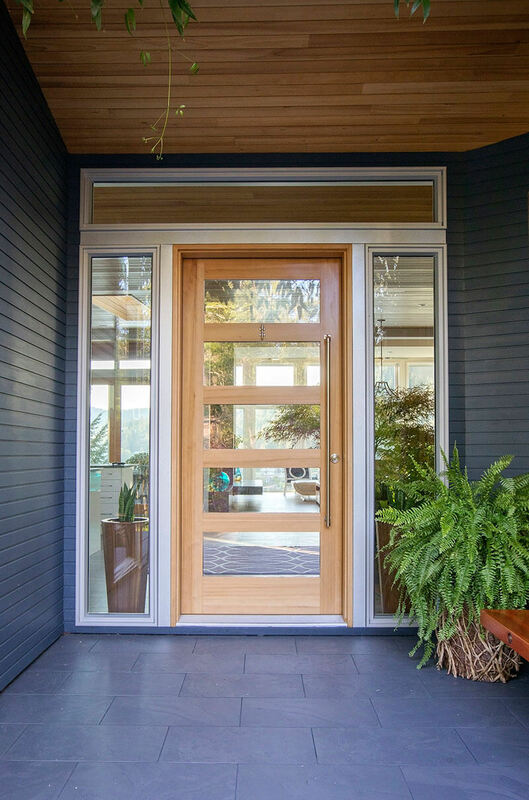 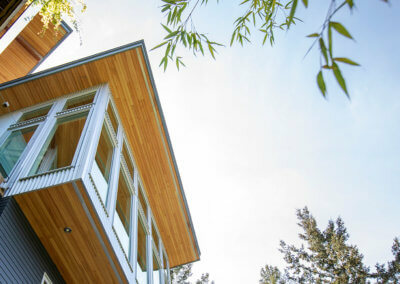 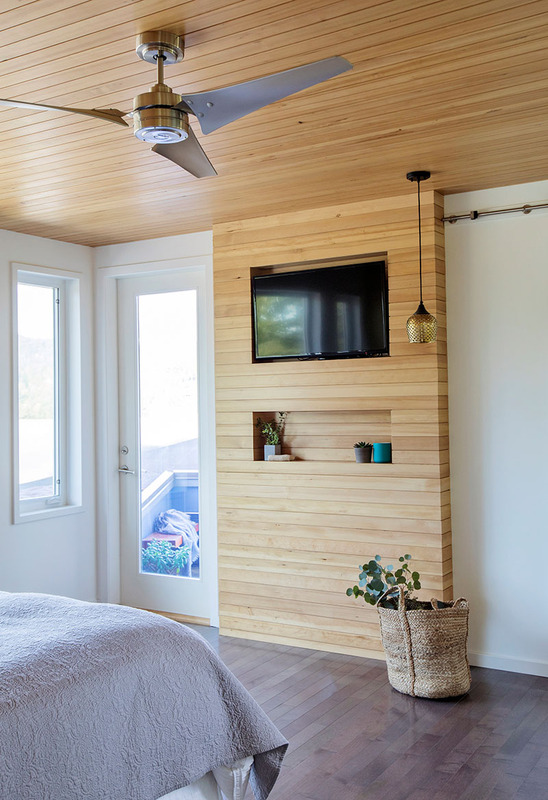 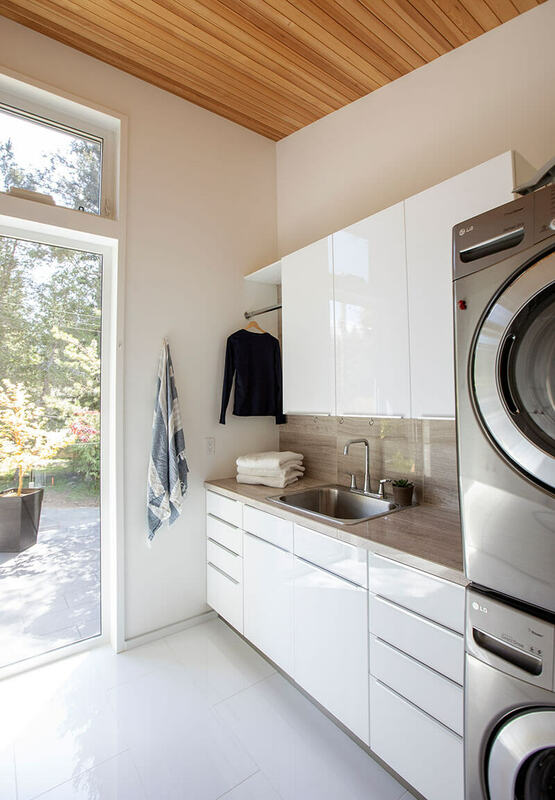 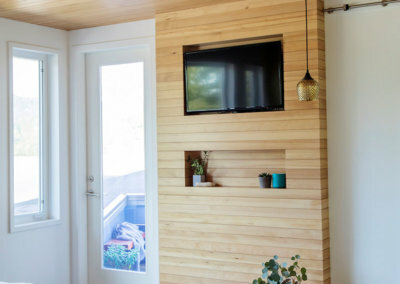 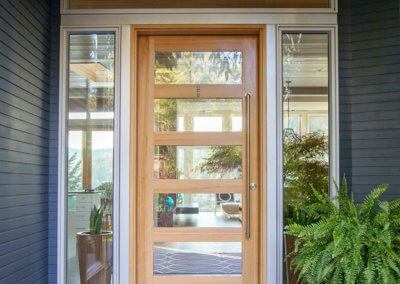 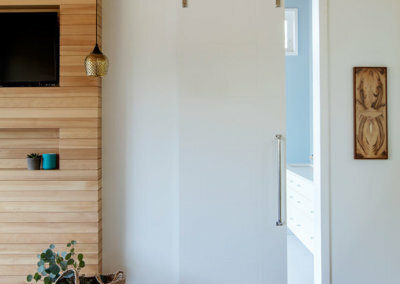 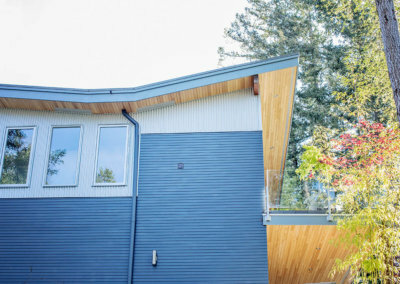 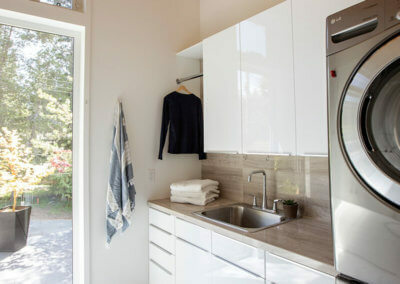 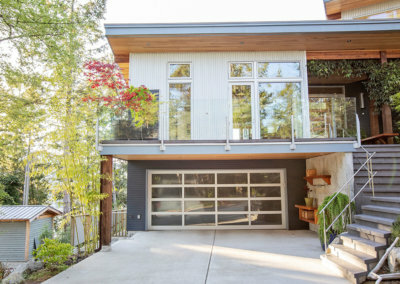 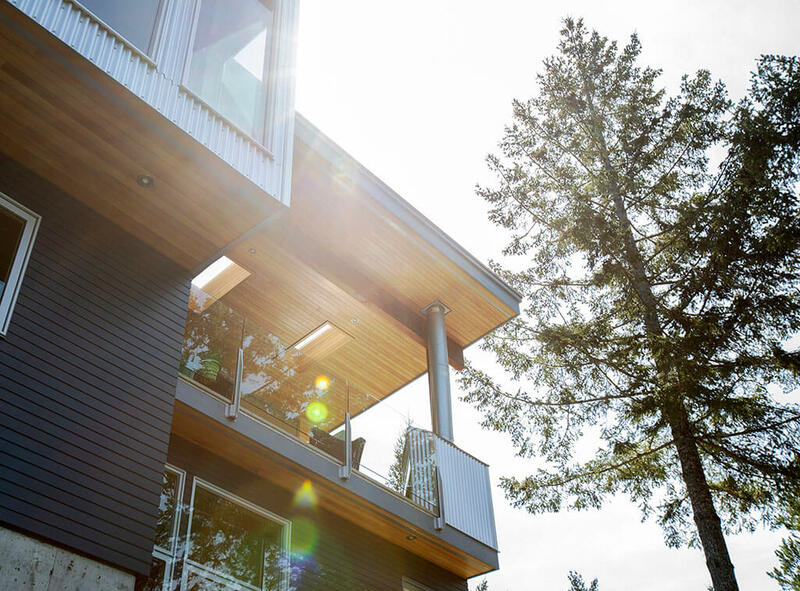 In addition, several cutting edge green features are on display including a planted roof which is overlooked by the master suite and solar hot water collectors which supply not only showers and sinks, but also the hydronic radiant in-floor heating system.